I continue to delve into the financial support for the mayoral race to determine how it reveals the sentiment of the community (and perhaps the outcome of the election tomorrow). Voters who contribute to campaigns are typically “true believers,” especially as the amount increases, and often actively campaign for their candidates and are rarely dissuaded by any contrary information or facts. Newton has many of them as can be seen in the chart above, but will it be enough? 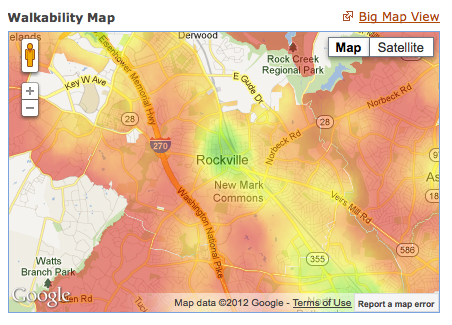 Is Rockville Walkable? Depends Where You Are. I’m sure this will generate controversy and prompt comparisons between neighborhoods (what!? Twinbrook rated the same as Fallsgrove and King Farm? Not possible!) but I’d really like to encourage a discussion about making our community more bike and pedestrian (and sometimes car) friendlier. A center: Walkable neighborhoods have a center, whether it’s a main street or a public space. People: Enough people for businesses to flourish and for public transit to run frequently. Mixed income, mixed use: Affordable housing located near businesses. Parks and public space: Plenty of public places to gather and play. Pedestrian design: Buildings are close to the street, parking lots are relegated to the back. Schools and workplaces: Close enough that most residents can walk from their homes. Complete streets: Streets designed for bicyclists, pedestrians, and transit. The City of Rockville recently received federal funds to develop “complete streets” near the Twinbrook and Rockville Metro stations, so scores for those locations (and pedestrians using those locations) should improve as a result. Any suggestions to make your neighborhood more walkable? Should walkability be a goal for Rockville? I am compiling candidate responses to the following question of concern to myself and a variety of other voters. I will publish said responses online so that other voters will have an opportunity to be informed. If you do not respond within a week, I will simply note your lack of response, then edit it in retrospectively, should you eventually provide answers. Potable municipal water is becoming more expensive to provide to the citizens of Rockville due to several factors. Much of the potable water is used for lawn and garden maintenance when untreated water would suffice. Amazingly, rainfall running off our roofs can be used for such watering if it can be collected and stored. Unfortunately for me, my Home Owners Association has a rule prohibiting the installation of rain barrels. As a city council member how would you ensure that rain barrels cannot be barred by HOA rules? Conversely, if you oppose rain barrels, please explain why. The threat of global warming requires action by individual citizens to reduce their carbon footprint and rising electricity prices add further incentive to reduce electricity use. One of the major electricity consuming appliances in the home is the clothes dryer, which also causes in accelerated wear and tear of ones fabrics. It is surprising that Rockville’s efforts to promote a greener future have not included the removal of the ordinance which outlaws the line drying of clothing on private property. Do you support line drying as an energy efficient way to dry clothing? Do you support the removal of any city rules barring line drying? Please explain. The few residents of West Argyle Street have petitioned the city for and received substantial changes to the traffic pattern over recent years. While some of the changes were necessary, others detrimentally impacted a large number of Rockville residents in Linfield, Hungerford, Waddington Park, Fireside and Courthouse Walk. The no left turn from West Argyle onto Maryland Avenue between the hours of 7AM and 9 AM targets local resident commuters forcing them to take a longer, more congested alternative route that consumes more time and adversely affects their property values. There is no evidence that cut-through traffic has been substantially affected by this turn restriction. As a member of city council how would you address the concerns of the far greater number of voters that have been adversely affected? These are such big questions, I’d like to respond to them as a regular post rather than have them get overlooked in the FAQ section. After I post my responses, I’ll remove it from this section to avoid confusion. If you want to hear the candidates discuss various issues and meet them in person, various neighborhood and community groups are sponsoring forums throughout the city. These forums are public and everyone is welcome to attend. Some people have called these “debates” but with a baker’s dozen running for office, I regret they are going to be more like brief statements with no discussion (I’m not even sure how they’re going to fit everyone on stage). Tuesday, October 7 at 7 pm: Legacy at Lincoln Park Homeowners Association at the Lincoln Park Community Center. Tuesday, October 13 at 7 pm: Rockville Chamber of Commerce at the Legacy Hotel and Conference Center (televised, not confirmed). I will be unable to attend due to work-related scheduling conflicts. Tuesday, October 20 at 7 pm: Twinbrook Citizens Association at the Twinbrook Recreation Center (televised, not confirmed). Thursday, October 22 at 7 pm: King Farm Candidates Forum at the Saddle Ridge Community Center (300 Saddle Ridge Circle). Saturday, October 24 from 9:30-11:30 am: Rockville Central at the Thomas Farm Community Center. Thursday, October 29 from 1-3 pm: Rockville Seniors at the Senior Center.